Lucy is adorable—love those ears! She’s a Red Heeler/Terrier mix and, despite her running in circles, I suspect she’s a little smarty pants. 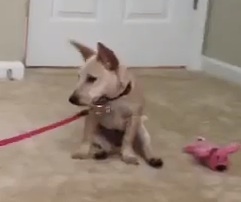 I think she totally knows she’s making the leash move. What do you think?